Often referred to as the ‘rainbarrel’ of Southern Ontario, the Oak Ridges Moraine provides a critical service to over 200,000 people every time they turn on the tap. Moraine waters sustain countless green spaces and a large number of diverse species who call the Moraine and related landscapes home. Scoured off the rocky earth’s crust by giant glaciers, the irregular shaped mounds of sand and gravel that compose most of the Oak Ridges Moraine absorbs water quickly. Instead of running off into streams and ponds as it would on some other soils, water that falls on the Moraine often seeps straight down, into the Moraine’s sandy core. The clean water that bubbles up from this aquifer feeds 65 river systems. In the diagram (courtesy of GEOSCAPES; Natural Resources Canada), you can see how the precipitation that falls on the Oak Ridges Moraine is absorbed into a sandy layer that is actually hundreds of meters deep. Here, it is filtered and stored eventually draining out via the many streams and rivers that originate from the Moraine. Clean and cold, the rivers begin here. For more information, visit the YPTD CAMC Oak Ridges Moraine Groundwater Study Website. The Oak Ridges Moraine (ORM) is a 160-km long ridge of sand, silt and gravel deposits that is oriented approximately east-west, and lies north of Lake Ontario. The site encompasses and extends north, east and west from the City of Toronto within the province of Ontario in Canada. One of the Moraine’s most important functions is as a water recharge/discharge area – sustaining the health of the many watersheds, which originate in the Moraine and directly providing drinking water to over 250,000 people. It has been described as southern Ontario’s rain barrel – its permeable sands and gravels absorb and collect precipitation, which slowly recharge the deep aquifers below the ground. These sand and gravel aquifers store, filter and release this groundwater to over 65 watercourses flowing north and south into Georgian Bay, Lakes Simcoe, Scugog, Rice and Ontario. At the same time, unprecedented human exploitation of this groundwater places the Moraine in a precarious ecological position. 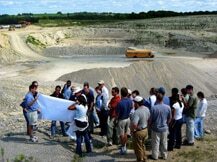 The 1991 Oak Ridges Moraine Planning Study, which began as a tightly focused land use planning exercise, became a catalyst for innovative water resource studies. The Ontario Ministry of Natural Resources, through the planning study, undertook a broad hydrogeological review of the Oak Ridges Moraine. This led to the involvement of the Ontario Geological Survey and the Ontario Ministry of the Environment in developing detailed geological and hydrogeological mapping. 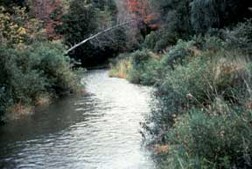 In 1993, the Geological Survey of Canada initiated an extensive five-year Oak Ridges Moraine study. The result of this collaborative work is an extensive ‘regional scale’ understanding of the Oak Ridges Moraine, exceptional by Canadian standards. Despite the focus of the Geological Survey of Canada and its call for integration of land-use planning and groundwater management, municipalities and the provincial government continued to carry on with business as usual – processing applications for development and official plan amendments in the absence of a comprehensive groundwater management strategy. Land-use changes, primarily the building of residential subdivisions, the construction of roads and the paving of parking lots increase the imperviousness of the ground surface, stopping water from entering the hydrologic cycle. Consequently, this surface runoff results in dramatic increases in wet weather flows of the headwater streams on the moraine causing erosion and degradation of these fragile systems. Urban and rural contaminants entering the ground today can remain undetected for many decades given the excruciatingly slow movement of water through the ground. Water-taking, associated with these new land uses, further exacerbates the pressure on the resource. Not only is precipitation blocked from entering the ground but more water is being removed. Municipal water supplies, golf courses and commercial water-bottling companies have, by necessity, begun to ‘go deeper’ into the Moraine to find adequate quantities of drinkable and usable water.